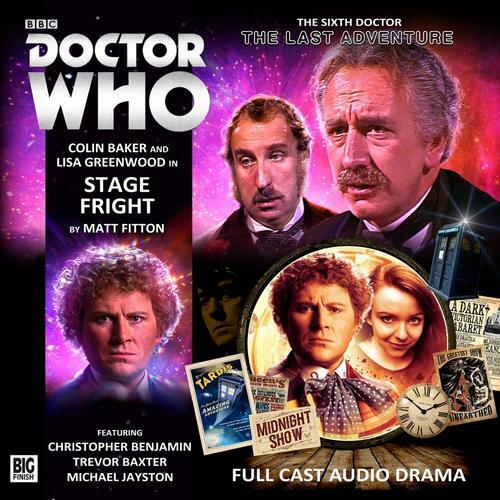 Stage Fright sees the old school meet the new school, as memorable characters of the Fourth Doctor’s era collide with a modern day companion of the Sixth Doctor, all under the scheming eyes of the Valeyard. The clash of cultures leads to a grand affair with solid performances aplenty and a haunting look into the final scheme of the Valeyard. Stage Fright is steeped in nostalgia for the classic series, but with a hint of modern flair. Matt Fitton came on board with Big Finish after submitting a piece to Big Finish during a period of open submission. While his piece wasn’t piece up, his work impressed the company to the point where they signed him on to write the 2011 story A Most Excellent Match. Fitton has been a prolific writer for Big Finish since that point, penning a full series for the Counter-Measures range, a handful of Companion Chronicles and Lost Stories, two stories for the Charlotte Pollard series, several Main Range stories including The Wrong Doctors and Starlight Robbery, and several stories for Paul McGann in the Dark Eyes saga, including the grand finale Eye of Darkness. Fitton’s script for Stage Fright is simply wonderful. He nails the voice of each character through dialogue, from the father-and-daughter dynamic of Six and Flip to the abundance of alliteration of Henry Jago to the thorough and thoughtful nature of Professor Litefoot to the working class stubbornness of Ellie to the purely diabolical villainy of the Valeyard. It takes good actors to make it all come together, but Witton’s script provides them with all the tools they need to make it work. Where Witton’s script also excels is how it deals with the past history of Doctor Who. The Valeyard is staging the five deaths of the Doctor in dramatic fashion (with slightly embellished dialogue for theatrical purposes) in order to soak in the negative life energy from those moments (via the deaths of the actors) using the psychic machine he stole during the events of The Red House. It would have been very easy to just harp on nostalgia and let it carry the day, but the young actors are…well, not good actors, and it shows in how often the Valeyard must keep casting new actors in newly updated death scenes. Fans of the old series will appreciate the callbacks (and Jago calling the events of Planet of the Spiders “a bit far fetched!”) and new fans will have enough information to know why these death scenes are so important. From classic series companions to new audio ones – Lisa Greenwood as Phillipa “Flip” Jackson is very impressive in this outing. Flip would meet the Sixth Doctor in 2011’s The Crimes of Thomas Brewster and go on to travel with the Sixth Doctor through seven audio adventures. Where Flip could have easily come off as the ‘cool hip companion’ that producers often introduce to shows to miserable effect, Greenwood plays Flip with a sense of enthusiasm and reality. Her relationship to Six is more of a father-and-daughter relationship, where Flip’s modern day pop culture references either slip past the Doctor or simply cause him to sigh and carry on. Stage Fright is the first audio I’ve heard with Flip, and I highly enjoyed her presence. She provides the fish-of-out-water aspect of a companion by being overwhelmed and just a bit critical (in a good way) of the London of her past, provides the companion-in-distress portion when she finds herself involved in Mr. Yardvale’s schemes playing Zoe during a recreation of the end of The War Games, and helps save the Doctor by overcoming one of her deepest fears – a case of, well, stage fright, in a moment that is absolutely wonderful and ranks as one of the most memorable scenes I’ve heard from Big Finish. Again, the highest praise I can give for Ms. Greenwood’s performance is that I’m looking forward to getting to The Crimes of Thomas Brewster and Flip’s introduction! From good to evil, and Michael Jayston flipping the switch from his charming and menacing performance in The Red House to being absolutely sinister and wicked in Stage Fright. So far, listeners have only gotten glimpses of the Valeyard’s evil, and of his brilliance. Stage Fright not only sees the Valeyard begin his final machinations against the Sixth Doctor, but shows just how much the darkest incarnation of the Doctor disregards human lives, casually throwing them away in an effort to keep himself going a little longer. There are hints of the Valeyard’s charm, especially in his scenes with Jago and his “directing” of the various actors and actresses who fall under his sway, but Jayston holds nothing back when he takes their lives. The climatic showdown with the Doctor is a masterclass in cloak-swirling villainy against bombastic heroism as Jayston takes full advantage of the chance to play the Valeyard once again. His turn in Stage Fright easily belongs in Big Finish’s Villains Hall of Fame! With all these performances, one would wonder if Colin Baker should keep up with everyone else. But if the Valeyard is the distillation of every negative and dark emotion the Doctor has ever had, then what would happen when he collides with the Sixth Doctor, who is full of nothing but emotion? Baker is, as usual, on the top of his game. Old Sixie is trying to show Flip some culture, but of course he’s going to get involved in when Litefoot explains about the slew of deaths…and when he finds out that it’s because the Valeyard is reliving the Doctor’s many deaths, the gloves come off. This is the angriest and most vengeful we’ve ever seen the Doctor…which may or may not tie into the Valeyard’s plans…but Baker gives off waves of righteous and justified indignation as he confronts the Valeyard on a stage so grand, we’ve one exit away from Suplex City. Where the Valeyard swirls his cape, the Doctor stands his ground, proudly proclaiming the one reason the Doctor will win and the Valeyard never will…the Doctor has friends. And before one rolls their eyes and proclaims just how cheesy that line is, here’s the thing – Baker sells the HELL out of it. It’s not melodrama, it’s not over-the-top, it’s over 50 years of Doctor Who condensed and distilled down into one simple concept – a Time Lord, who sees all of time and space, choose not to live above everyone else as their master, but instead to interact with them as colleagues, friends…and companions. It’s just wonderful, and one of the reasons that (spoilers), I can Stage Fright is my favorite out of the four stories…and that’s not a slight to the still-quality conclusion The Brink of Death. There is no other way to put it, and it’s probably obviously from my glowing review – Stage Fright is an amazing story. If this had been a stand alone story, it still would have been one of the best audios Big Finish ever produced. As part of The Last Sixth Doctor Adventure, it’s the Empire Strikes Back of the four stories – self-contained with an ending hook that leaves you wanting more. Witton’s scripts mixes with some fantastic performances all around, as well as some quality soundwork that recreates 19th century London down to the last hoof on cobblestone. Stage Fright is simply wonderful and the perfect set-up for the final showdown between the Doctor and the Valeyard. – Not one. Not a single one! Cobi’s Synopsis – One of the best stories Big Finish has ever done, Stage Fright mixes classic series companions with new ones from the audios, all under the piercing eyes of two fantastic performances from Michael Jayston and Colin Baker as the pieces are put into place for the final showdown between the Doctor and the Valeyard. Colin Baker is the Doctor in…The Last Sixth Doctor Adventure – The Brink of Death. This entry was posted in Big Finish Review and tagged Big Finish, Big Finish Audio, Big Finish Review, Christopher Benjamin, Colin Baker, Doctor Who, Doctor Who Audio, Doctor Who Review, Flip Jackson, Jago & Litefoot, Jago and Litefoot, Lisa Greenwood, Michael Jayston, The Valeyard, Trevor Baxter. Bookmark the permalink.